A United Launch Alliance Atlas V first stage was lifted by crane into the Vertical Integration Facility on Jan. 31, 2018, at Space Launch Complex 41 at Cape Canaveral Air Force Station in Florida. The rocket will be positioned on its launcher to boost NOAA’s Geostationary Operational Environmental Satellite (GOES-S). The satellite is the second in a series of four advanced geostationary weather satellites that will significantly improve the detection and observation of environmental phenomena that directly affect public safety. 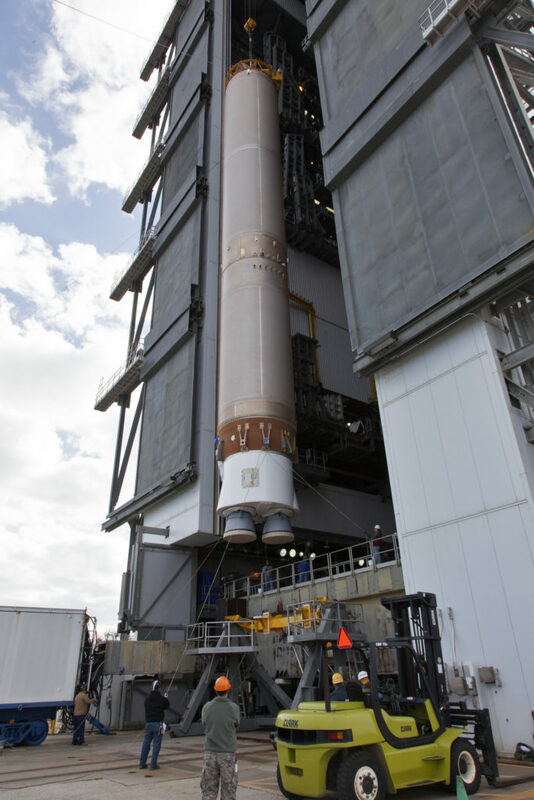 GOES-S is slated to launch March 1, 2018, aboard the Atlas V rocket.